People are already talking about How To Haunt Your House! Advance copies of the book were sent out to haunt industry professionals and the reviews came back with overwhelming enthusiaim. Please feel free to send in your own reviews. We want to know what you think and how we can improve for book two already in progress. Just send us an email. In 1999 a small group of home haunters joined together and sent pictures or video of their home haunts to be compiled into a single VHS tape which was then copied and distributed to the group. This was the start of a tradition that continues today with a set of Haunt DVD's. I became involved with this project in 2001 when I volunteered to help duplicate the VHS tapes. In 2002 I helped move the set set from VHS to CD's and in 2003 I took over this project and distributed the haunt videos on DVD for the first time. Since then, I have had the honor of compiling the Haunt DVD set each year. The Haunt DVD's typically have over 100 of the finest home haunts including haunts from every part of the US, Canada and even a few haunts from Germany and England (where Halloween is just starting to become popular). In addition to compiling the annual Haunt DVD set, I am a serious home haunter myself. I am a founding member of The Rocky Mountain Haunters group and spend all year building props and getting ready for Halloween. 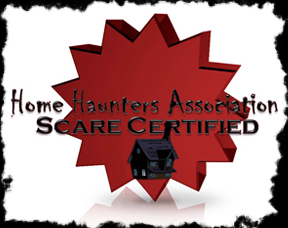 I tell you this so you know that when I tell you how comprehensive, detailed and just flat out helpful, How To Haunt Your House is, you will know that I have considerable experience in how I and many, many others haunt their houses. This book covers a broad range of great props for making your home that one house all the kids talk about, not just at Halloween, but all your long whenever Halloween come up. The house they will tell their children about, "When I was a kid there was this one house that really scared us...."
How To Haunt Your House is a masterpiece. The information on exactly what to use and how to use it, explained in a way you will understand and be able to create these props, with detailed pictures, is the best book on the subject I have ever seen. 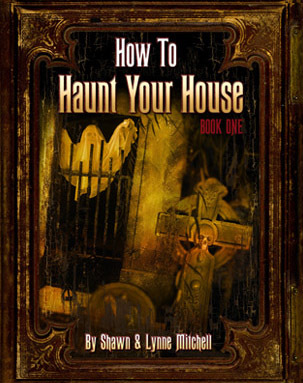 The Mitchell's (Shawn & Lynne) are award winning home haunters themselves and their efforts to create a book to help others haunt their house have paid off by creating a book no one interested in creating a great Halloween display will want to be without. This book would be valuable to both those like myself with decades of home haunting under their belt as well as those just starting out in Halloween decorating. Add this book to your library, you will not be sorry!" The book looks great! Super visuals, clear-cut instructions... and very well put-together. You do amazing work with the haunt, and the book shows that clearly. I can't wait to see the final print version. (I am SO buying a copy for my collection!!!) Thanks for sharing!! Brief Overview: A book designed to provide Haunters and Halloween enthusiasts with quality step by step information to enhance their Haunts or Halloween endeavors. Upon receiving the book in it's entirety, I knew that this was a piece that took much time, insight and planning. It was clear to me that the review of this book would take some time. It's not a book that you throw together and market. It's general flavor was above and beyond. The book is colorful, campy and the entire presentation was user friendly. The text is easy to read. The books images and pics entice me as a Haunter and add a certain feel to the book that Halloween Haunted House addicts so desire. The content is amazing. Not only does the book offer a thorough index but the topics included in the first book start out on the ground floor in an easy to understand fashion. 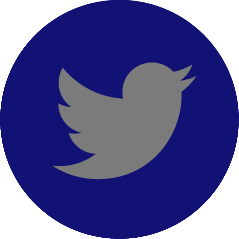 All of the content is illustrated with step by step instructions on how to achieve your goal. 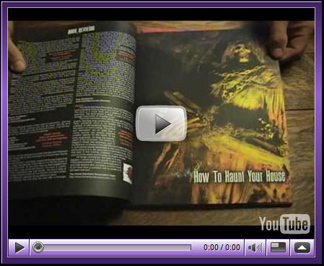 The book has pointers that outline all of the components of a prop and explains it's features. The language is simple. I find this to be very important. Haunter talk can be understood by a person who has dabbled in this industry for a long time. A beginner should have the ability to navigate through the book and easily understand the lingo. This is the case here. Speaking of books and magazines, I would most likely be excited to see what's to come. I feel that all of the Halloween Haunted House books and magazines are insightful but I'm partial to this one because it's not a sales pitch. 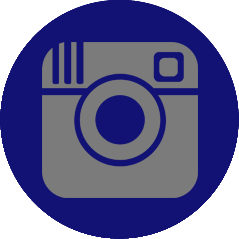 It doesn't give you bits and pieces of information that are stretched out and have sole intention on advertising. The information you seek is the information you will find. From speaking to the author(s) I feel that this is one of those books that will be talked about for years to come. I feel that people will want a copy even if it's for pride of ownership. 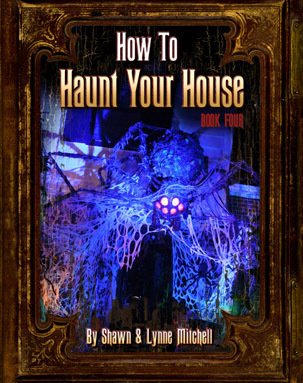 One of the authors Shawn Mitchell (SherlockSam) has been a member of HauntSpace for quite some time and has contributed wonderful knowledge to the community. All in all, I've had the occasion to read some Haunt books. All of them were interesting. I would prefer not to name the books because I'm speaking of "this" book. I will tell you that some of the books lacked an exciting look and feel. Instead of reading a book that put me in the mood, I found myself feeling like I was back in high school, listening to the typical mono tone voice that went on and on, placing me into a daydream about something else. Teachers of today found that the number one attribute of good teaching is to make the lesson fun, easy to learn and keep the student interested. In my opinion, this has been accomplished with this book. I would probably leaf through the book just to look at the pictures inside because I find it motivational. It's easy to tell that the authors of this book put the project into motion because of their love of Halloween and the Haunted House Industry. Without hesitation, I give this book a 5/5 star rating. Sometimes, just sometimes, a book comes across your altar that makes your hands go clammy, that sets your heart racing, that makes your eyes go bug wide in wonder. How To Haunt Your House is such a book. Its deceptively simple title sets the stage (literally) for what the book is about – a visual feast of step-by-step techniques on, well, how to haunt your house! I have never come across such effective, clear-cut pages of just how to create the fantastic props and effects that home haunters create for that one, single, magically, horribly satisfying night of the year! Everything you need to know about building a haunt is here – starting with recipes for monster mud to working with Styrofoam, and effective spray paint applications to create that 200 year old marble tombstone. From these basic but extremely effective tutorials, the authors plunge you into the real WOW factors that impress even jaded adults – floating heads and illusionary figures using television projections (”Pepper’s Ghost”), mausoleums that look endless by using trick mirrors, gothic fence-building techniques, 8 foot tall monster props, and eerie lighting effects. Throughout, the authors guide you on how to put everything together into one fantastic, spooky presentation - from your front yard and exterior of your house up the steps to your door, integrating delightfully spooky scares along the way. This book is a must for not only the beginning home haunter, but for the advanced ones as well. There’s more than a few techniques that had me going “Good Lord! I never thought of creating fog that way. How so much easier!” Heck, I never even thought of creating moss for my tombstones using ordinary dryer lint and spray paint! You can tell Shawn and Lynne Mitchell put a lot of care and work into this book – each page of their step-by-step instructions are also visually stunning masterpieces of art. Everything is clearly detailed, and nothing is left out. Anybody should be able to share in the fun of “haunting out” their houses, and this book makes it extremely accessible to all Halloween lovers. The title says this is Book One, so I certainly can’t wait for the sequel! The Home Haunters Association Team just finished reviewing the soon to be published /How to Haunt Your House/ by Shawn and Lynne Mitchell. The book is a visual feast and a goldmine of information on haunting technique. The book covers a range of topics from basic craft technique through construction of complete props. The book combines clear writing style with incredibly beautiful photographs depicting prop construction from start to finish. One example is a Celtic tombstone which is so realistic that it includes moss! Another example of well-explained technique is the section on sand casting. The photos and description are so clear that a novice haunter can quickly duplicate complex objects for the haunt. At the book progresses, so does the sophistication of the technique. The section on Pepper's Ghost (the technique used in the Ballroom of Disney's Haunted Mansion) make a technique mainly found in commercial haunts accessible to the home haunter. If the book has any shortcoming it is in the discussion of animated props. There's very little on that topic in this volume. However, I understand that there is a second volume in the works and I'll keep my fingers crossed. All things considered, this book is a masterpiece. I would give it five skulls! I'd give it six if that were possible. I want a hard copy and I'm sure that anyone who considers a home haunt to be more than a pumpkin with a candle in it will want one too!! 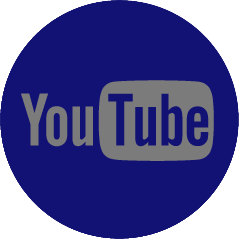 Raven's Barrow - Halloween and Horror in Modern Culture, creator, Patrick Nottingham has created a lengthy video book review of , How To Haunt Your House. View the video here. Welcome, foolish mortals, to The MonsterGrrls' 31 Days Of Halloween! 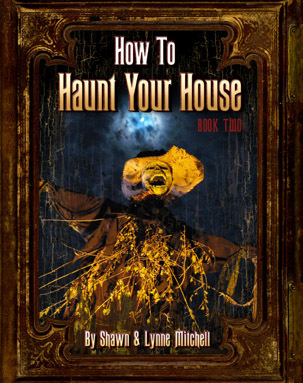 We're glad to be back for 2009, and extremely proud to present our favorite new home decorating book as the first post for our 2009 Edition--How To Haunt Your House, written by Shawn and Lynne Mitchell. The Mitchells are a husband-wife team of accomplished artists and home-haunting enthusiasts from Pensacola, Florida, who spend every Halloween turning the front yard of their home into The Mitchell Cemetery, which has become a popular Halloween attraction in Pensacola. The Mitchell Cemetery was featured in Fearnet.com's 2007 series Route 666: America's Scariest Haunted Houses, and won Best Yard Haunt for 2007 from the Haunt X Awards (an awards series for home haunters). 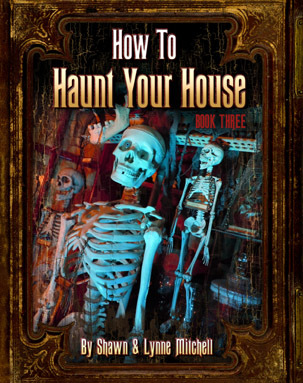 Now the Mitchells have compiled their mad science into a self-published book entitled How To Haunt Your House, which was released this year. There are already mutterings of a second volume of how-to's planned for 2010. Folks, this book is nothing less than a skeleton key to the Haunted Mansion. The beautiful photographs of the Mitchells' work, as well as their clear, concise step-by-step instructions for turning your own domicile into a Dream Spookhouse to be reckoned with, makes this terrorific tome a must-have for the Halloween decorator. 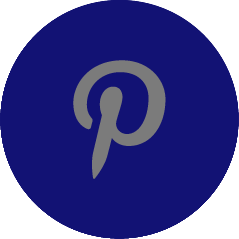 It shows you how to construct tombstones, cemetery fences, and small details such as fence finials and so forth using simple items such as PVC pipe, styrofoam and hot glue. You can build such items as an endless mausoleum, a perpetually-drinking ghoul fountain, your own Pepper's-Ghost effect (still used in the Disneyland Haunted Mansion to this day), working prop candles from PVC pipe and hot glue, and any number of tombstones that look miles better than the cheap stuff at discount stores. 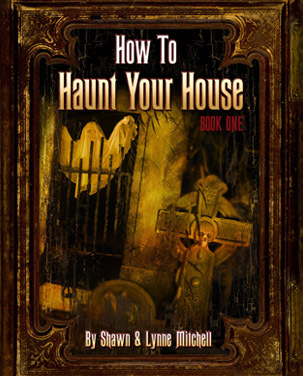 The Mitchells also have a website, www.howtohauntyourhouse.com, where this book can be purchased. The site also contains pictures and videos of the Mitchells' nutty doings and lots of cool downloads (one of which is a fantastic pattern for a seance-board tabletop!) for your own experiments and spooky doings. We just can't say enough good things about this book. If you have an itch to create your own spookhouse for Halloween but don't know where to begin, this book is the item to have as a starting point--simple, precise, and absolutely amazing. Get your copy now. I'm going to go out on a limb here and make a very grand statement... This is the single greatest book about home haunting I have ever seen. Every project is genius and the photography is gorgeous. And what's even more impressive is the Mitchell's self-published this, so what you're getting was created entirely by them! 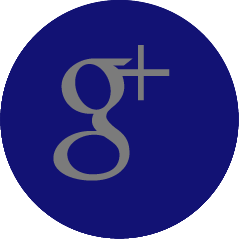 No publishing powerhouse with an army of editors and designers. Just two people who really know there stuff.